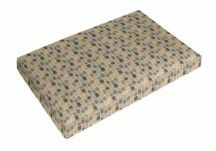 Imagine sleeping on cozy firm cushion that can be used on an indoor or outdoor daybed? Our optimal daybed cushions from Designer Custom Source can bring your clients sweet dreams to reality. What makes these cushions stand high above the rest? We start off with our quality upholstery foam that is layered with Micro-gel memory foam on the top and bottom. We then wrap this from front to back with 1" poly fiber batting for even more plushness which is then placed inside a weather-resistant ticking; perfect for the outdoors and indoors. Because you select the fabric, welting, ties and thickness of the daybed cushion, we allow true customization at your fingertips. Whether you are creating a dream daybed near the pool or inside your clients home let Designer Custom Source provide you with ultimate luxury and durability with Optimal Comfort daybed cushions.